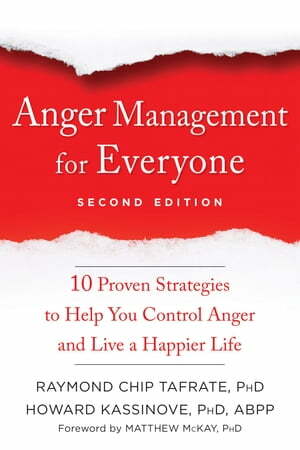 Collins Booksellers - Anger Management for Everyone by Raymond Chip Tafrate, PhD & Howard Kassinove, PhD, ABPP, 9781684032280. Buy this book online. We all get angry sometimes. But if you feel angry all of time—and if your anger makes others uncomfortable, creates distance in your relationships, disrupts your ability to think clearly and make good decisions, or otherwise results in behaviors that you regret or find embarrassing later—it’s time to make a change. Written by two clinical psychologists with decades of experience using cognitive behavioral interventions to treat anger, Anger Management for Everyone provides a comprehensive, research-based program to keep anger in its place. This revised and updated second edition includes new information on the environmental effects on anger, such as hunger and sleep; new progressive muscle relaxation and mindfulness exercises; and new strategies and tips for improving social and interpersonal skills. With the authors’ enhanced “Anger Episode Model,” and the ten proven-effective skills for anger management in this helpful guide, you’ll come to better understand and control your problem anger, learn how to cope with everyday disappointments and frustrations, and experience more happiness, success, and vitality in all areas of your life.